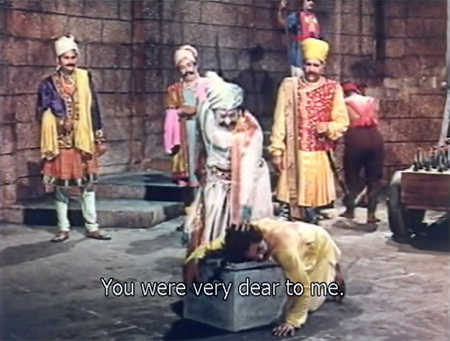 Maharaj Vikram Singh (David) rewards his Senapati Sangram Singh (Niranjan Sharma) with a crown and kingdom of his own after Sangram Singh saves his life on the battlefield. They seal their friendship with a promise that Vikram Singh’s newborn daughter Anuradha will marry Sangram Singh’s son Pratap when they come of age. 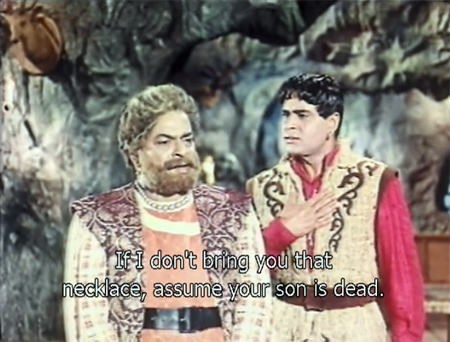 Vikram Singh also gives Sangram Singh a valuable heirloom necklace, which Sangram Singh puts around the neck of his young son—a bad idea, in my opinion, especially since the Rajkumar is an active kid who gets into trouble a lot according to his mother (Lalita Pawar). And indeed, as he is playing with his tutor Ram Singh later, the necklace falls off and is found by a maidservant who keeps it. When the necklace can’t be found, Sangram Singh accuses Ram Singh of stealing it, and punishes him severely (a whipping followed by something done with a pair of red-hot pokers that isn’t shown and that I don’t want to think about). I don’t think much of Sangram Singh’s ability to give the benefit of the doubt to those very dear to him, and neither does Ram Singh. He is sent home in disgrace to his own young son and daughter, who will now be branded the children of a thief. He takes to the hills with them to live outside of society, and swears vengeance against Sangram Singh. Sangram Singh in the meantime discovers his mistake and in remorse sends for Ram Singh—but it’s too late. The inexorable wheels of retribution have started turning. 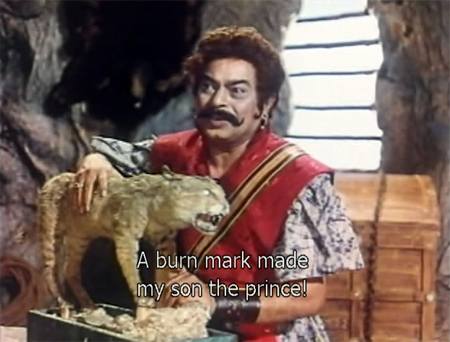 Ram Singh now does not even spare his own son from his plotting: he burns his son Suraj in exactly the same place as Pratap’s burn scar, and four years later sends an old woman with Suraj to the palace to take the missing Rajkumar’s place. Maharaja Sangram Singh and his wife are rather easily convinced by the evidence of the burn scar and the clothes that Pratap was wearing when he went missing, and they embrace him joyfully. 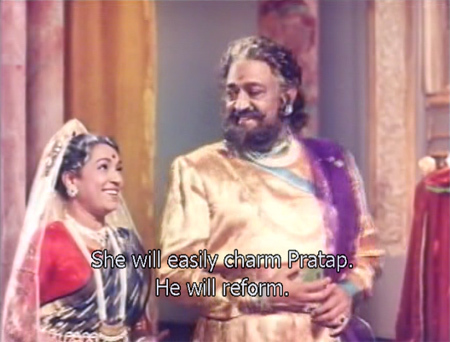 Back at his den, Ram Singh kills the old woman to keep her chup and vows to make the real Pratap—now called Suraj—into a dacoit. I laugh and laugh at his tatty old stuffed cat, which looks like it was pilfered from a dusty old museum in decline. But a villain must have a stuffed cat to decorate his lodgings! 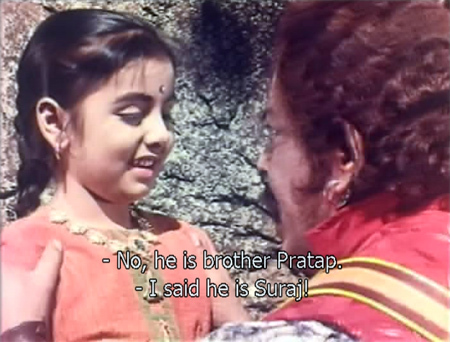 Ram Singh’s little daughter Geeta (Neetu Singh) is confused by her brother’s new name. Neetu is the cutest little girl EVER, so plump and pretty, with a long glossy braid. Darling! This is a lot of plot already, and our second generation is still in childhood! But now-Suraj grows up to be Rajendra Kumar and a very successful Robin Hood-type, and now-Pratap grows up with his doting royal parents to be Ajit—and a royal nightmare for the local girls. 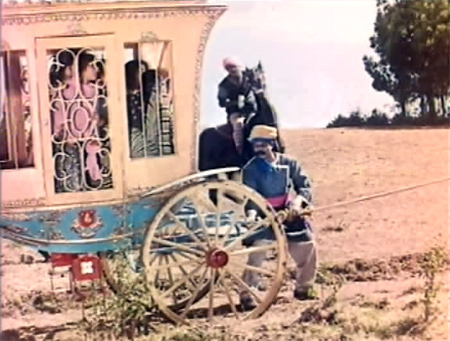 He has a cage in the form of a stagecoach which he routinely fills with village belles. It reminds me of the Childcatcher’s carriage in Chitty Chitty Bang Bang. Suraj rescues a bunch of them one day with the help of his friend Bhola (Johnny Walker) and his tireless and loyal elephant Heera (he also has a white horse aptly named Bahadur). Pratap’s shenanigans have not endeared him to his subjects, and his father Sangram Singh is tired of all the complaints he hears about his son’s behavior. He decides not to crown Pratap during the upcoming 25th anniversary celebrations of his own reign, and the Maharani encourages him to get Pratap married to Rajkumari Anuradha, who has grown up to be Vijayanthimala. Anuradha herself is a feisty and intelligent girl, who chafes at the restrictions of her royal life and who rules her doting father with a velvet-gloved iron fist. She has no intention of marrying Pratap Singh, despite Vikram Singh’s assurances that Pratap is a handsome and intelligent man. She agrees to go to Sangram Singh’s festivities, but insists that she go alone except for her maid Kalavati (Mumtaz). Poor Kalavati! On the way, Anuradha makes her switch places with her so that she can have a little freedom and assess the worth of her betrothed by finding out what the common people really think of him (smart girl!). 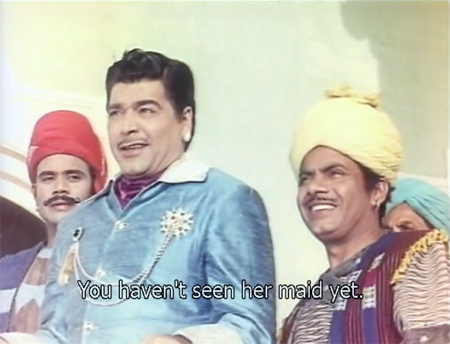 Of course she also meets bandit Suraj, who saves her at a local fair from being kidnapped by Pratap Singh’s men. 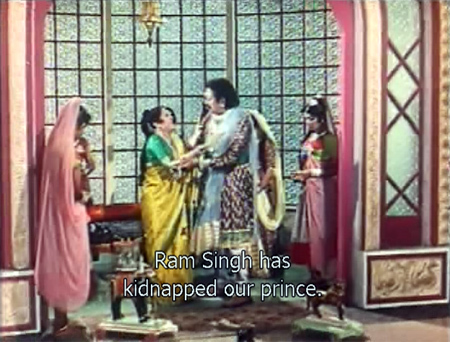 Meanwhile, Ram Singh plots to further his revenge, using Suraj as a pawn. 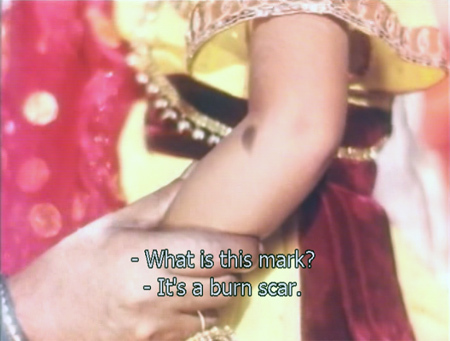 Dialogues like this, well-choreographed sword-play—Vijayanthimala gets a turn at it, and she’s good!—sweet romance, beautiful songs, and breathtaking dancing in a story that constantly surprises and entertains make this one of the best of its kind. Even the CSP isn’t too bad, featuring Johnny Walker opposite Mumtaz’s sister Malika along with Mukri, Agha and a buffalo. Plus, as is usual with these palace intrigues, every frame contains some sort of eye candy that I WANT. Where is the warehouse where these things are stored, where?! 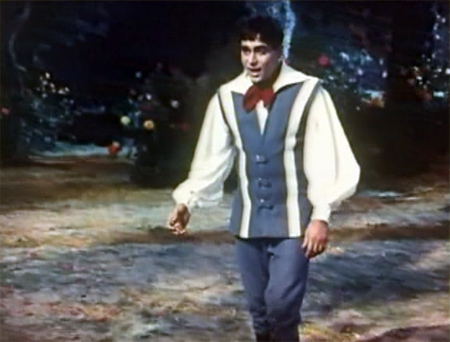 And the dacoit (Ranjeet—are you listening?) to loot it for me? See Suraj. Just see it. Look up the songs online. That is all. Posted on April 14, 2010 at 5:05 pm in Hindi movies	| RSS feed You can skip to the end and leave a reply. I did, I did. I saw it in real time in a theatre, and loved it. The titli udi song was a hit with us kid. That lovely flower hammock. It is the first movie I remember seeing as a kid, I thought it was the BEST. I wonder if Rajendra Kumar EVER looked young .. hehe.. I am tempted to order a DVD .. I love fun movies with lovely songs. That does it… Induna, here I come ! What a lovely film is my reaction on reading your review. Wish had known about this when I was in India – would have bought this along with scores of other oldies! I have seen some songs from this film – they are good. Vyjanthimala is always a treat to watch. Mumtaaz too looks so lovely in the screencaps. And thank YOU for reading and commenting, it keeps me going! I have seen this movie a while ago on rajshri, I’m going to watch it again in light of your lovely review :) You make it so divine an experience that I’m actually excited about rewatching it…. Awww…that is really nice to hear :) Thanks. And do watch it again. And again. And again. I’m going to! I’m not a big Rajendra Kumar fan, but he’s quite OK in capers like these. I’ve seen this only in bits, need to see that flower hammock and the elephant, and Mumtaz. Isn’t Vjyanthimala something? Waheeda Rehman and her have you hooked to the screen whenever they appear. They are THE dance queens. What happens to Neetu Singh by the way? He is just fine in this, and Ajit is great too. 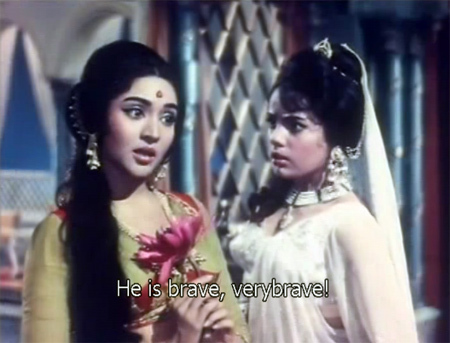 Vijayanthimala is just stunning too…and of course Mumtaz ALWAYS is. Neetu Singh grows up to be Bharati and is a loyal and true sister to Suraj, but if I told you what happens to her I would have to kill you :) You will just have to see the whole thing! Great dancer Vijyanthimala. 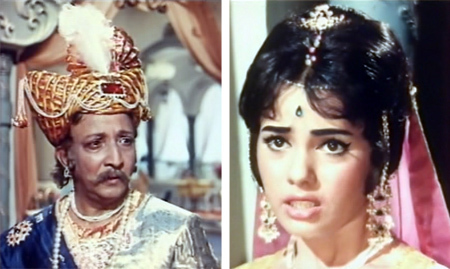 So was MUmtaz…. I think Memsaab has already put up the link somewhere but I couldnt find it on this site. That was put together by tommydan1 :) We love him here even though he makes fun of my taste in movies. This movie was a big hit – if I am not mistaken this was the turning point for Ajit too. He used to do hero/character roles till he turned villain in this movie. It became such a hit that he never looked back. This was the time of the Lata-SJ rift. Which explains Sharda and Asha Bhonsle singing. I also love “chehre pe giri zulfen”, “itna hai tumse pyar” and “kaise samjhaon”. Am off to listen/watch all of them now. :-) Thanks for the review. For whatever it is worth, the second movie I remember seeing in my life was “Evening in Paris”. Yes, you could definitely add Bahadur to the list of things from this film that I WANT. And thanks for the info on Ajit, makes me like this even more since I love him as a villain (liked him as a hero too, but he is just such a GREAT villain). I don’t think the “Suraj” soundtrack was the *result* of a rift between Lata and S-J, but rather the *cause* of it. Or more specifically, the use of Sharda caused some issues between Lata and Shanker. I don’t much care for Sharda (don’t hate her either as so many do), but always thought Lata’s reaction to her didn’t exactly reflect well on Lata. Yes, I too have known of Shalini’s version. I think she wasn’t popular because of the way she pronounces the words which is very childish. Of course from what I read, music director’s weren’t keen on using her for fear of getting into Lata’s bad books. I saw a concert in 1977 – it was called “Shankar Jaikishen Night”. It had Sharada, Talat Mahmood, Manna Dey, Nitin Mukesh (for Mukesh songs) and a Rafi clone (no original Rafi unfortunately). Sharada did very well that evening. She was quite the star. Since this was Eastern India, she even threw in some Bhojpuri numbers (Bhojpuri is a regional dialect of Bihar in Eastern India). The songs she sang included of course “Titli udi” and “Around the World”. Should not forget Suman Kalyanpur. She sang the “itna hai tumse pyar” number with Rafi saab. This would almost certainly have been Lata if there had not been a rift. I am quite happy to listen to Suman Kalyanpur. Oh what a treat to read your review of this very wonderful and entertaining film, memsaab. 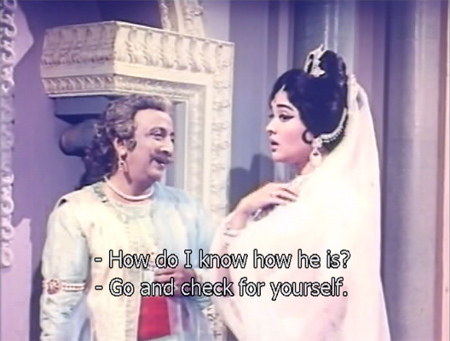 The moment Vyjayanthimala decides to go inspecting the man she has to marry and then changes her role with mumtaz, I knew the film was going to be great. Looks like a wonderful film and I don’t think I have this DVD…must find this one! 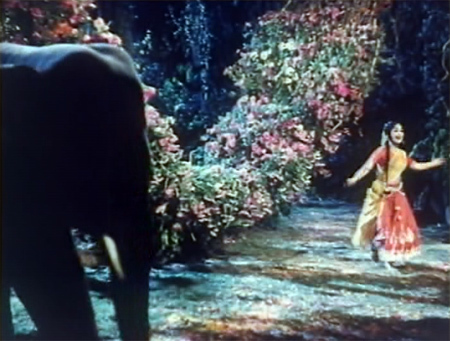 I really liked Rajendra Kumar and Vijayanthimala in JAANWAR…and add Ajit to the mix, and I am there! It’s a really fun movie, I think you would enjoy it! Unfortunately this is not the first movie watched by me as a child (unlike Raja and Ava), but I clearly remember the songs of this movie being perhaps the first ever songs to make deep impressions on me. “Bahaaron phool barsaao” was the first big hit to my ears that I heard in my life, followed by “Titli udi”. Of course, I was not aware at that time about the name of the movie. Much later (read last year), I discovered the other songs of this movie, including the fabulous “itna hai tumse pyaar”. The story certainly is a pre- teen kid’s dream stuff, and I am not surprised that the kids of that time (including grown ups- who too tended to be kid like in their liking of such movies) loved this movie. Rajendra Kumar (then known as Jubilee Kumar for his ability to churn out hits after hits), Vyjyanti Mala, Mumtaz, Ajit- it cannot get any better. I saw on your blog that you have covered all the songs from this already :) I know you don’t watch movies, but you might enjoy this one even as a grownup! Mentally I am still a 12 year old, but the reason I do not feel like watching movies is that I cannot bear the thought of spending three hours on a movie when I can have several songs in those three hours. Here is a little story that did the rounds those days. The press had linked Shanker (of the Shanker Jikishen team) and Sharda romantically. Lata Mangeshkar had supposedly remarked – I had heard that love is blind, did’nt know it was deaf too! Supposedly Sharda did not have a technically perfect voice. Forgot to add (though most people know) Sharda sang most of her songs for the Shanker Jaikishen team. I read that Sharada was one of the big reasons for the rift between Shankar and Jaikishen. The latter was not particularly keen on her, from what I have read. Of course another reason for the rift was that apparently they had a pact that they would not reveal to the outside world which of the two had composed which music (they always presented their music as a combo) but Shankar apparently broke it in one of his conversations. I don’t remember details now, unfortunately. Like you say, Greta, Sharada had a distinctive voice suiting a certain type of song. Certainly not a Lata replacement (Suman was closer though Lata was definitely better IMO) but that does not mean Sharada had no place at all in Hindi music. Not everybody has to be a Lata or Asha clone to be a singer in the Hindi film industry. No in fact I think that Lata and Asha’s predominance probably deprived us of some very nice voices :( Could probably say the same for Rafi/Kishore—and I love all four of them, but variety is the masala of life after all! I agree with you, Mem. Variety does make things far more interesting. Though in the male category, I suppose the playing field was level with Manna Dey, Mukesh, Hemant and others no less respected or recognized than Kishore/Rafi. A similar diversity in the female voices would have done good to Hindi film scores. I think Sharda’s unique and original style exactly fills that gap. PS: Don’t see any reason why Ajit’s hair should be more real than Rajendra’s! And also, Rafi and Kishore had very different voices…whereas I anyway can barely tell the difference between Asha and Lata’s…(heresy?! *ducks*). I’ve noticed that ;-) (thank you! )…happens with actors/dancers too. Lata’s voice is vastly different from Asha’s voice. It is Suman Kalyanpur’s voice which is often difficult to tell from Lata’s voice. Yes, I too find Suman K’s voice very similar to Lata’s but Asha’s is very different. Another very good voice was Vani Jairam. I love her bhajans in Hema’s Meera. There were quite a few wonderful singers, never allowed to shine. One of them was Hemlata. She sang a number of melodious songs for Rajshri movies (Akhiyon ke Jharoaken se, Dulan Wahi Jo Piya Man Bahay etc) where Ravindra Jain was the composer. Apparently there was professional rivalry between these siblings (Lata and Asha). Asha was tired of being type cast as a singer by music director (ie only cabarets, mujhras etc) in the 60s although she did sing a number of hit songs with OP Nayyar earlier. She did prove her versatility in other romantic songs in the 70s and ghazals in Umrao Jaan in 1981. Sai Paranjipaye made a movie on the rivalry between these two siblings – can’t remember the name. 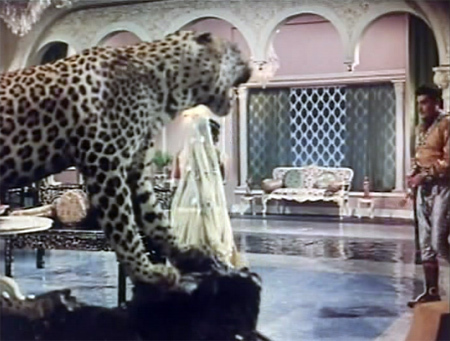 Aruna Irani and Shabana Azmi were the lead characters. Tabla Maestro Zakir Hussain also acted as a music director in the movie (wonder if it was a reference to RD Burman in Asha’s life)? THAT’s the one I remember, from Guddi :) Thanks. That flower hammock really does make an impression on everyone who sees it! I always thought SLB was harking back to this song in Devdas when he has SRK and Ash make out by the pond in Ras Leela mode. 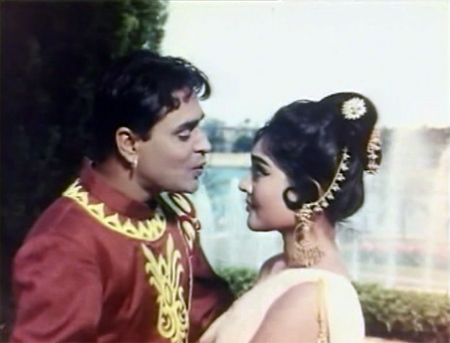 Rajendra Kumar and Vyjyanthimala are not my favorite couple, but this movie was fun enough to take me along with it. Apparently Kumar Gaurav has gone on record saying that this is the ONLY movie of his father’s that he has really liked. Surprising that Rajendra Kumar worked in so many jubilee hits. Aayi Milan Ki Bela, Kanoon, Aarzoo, Sangam, Mere Mehboob aresome movies that I personally like. Saw this movie last night – absolutely enjoyed it. 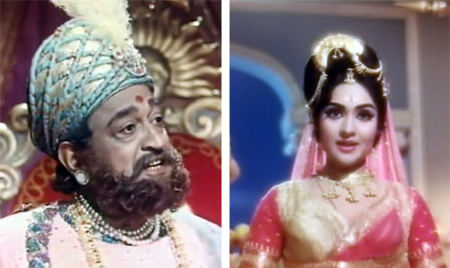 Agree with you – both Rajendar Kumar and Ajit were way too old to be playing these roles. However the story, direction, lovely music, bahadur and heera plus Vyjanthi’s dancing as well as a young and beautiful Mumtaaz more than made up for that! Thanks once again for bringing this movie to my attention. Baharon phool barsaon is a famous song. It is melodious and well picturised ie the swing adorned with flowers song. Sharda’s voice is the only false note. Lovely tunes but strance voice.